The room plan is designed to enable the user to have full supervision of all the necessary data. The different shades indicate the status of the reservations and the icons of their origin. Changes and interventions such as differentiation of days of stay, cancellations and transfers are straightforward and easy. It is possible to automate the registration of reservations and minimize staff time and human errors. Information such as the total of rooms available and the total occupied per day as well as the channels from which they come are presented. Access to the plan becomes easy for all involved, and updates are updated in real time so that the full picture is always available. The bnbwiz management system offers the ability to interface with all OTA’s. 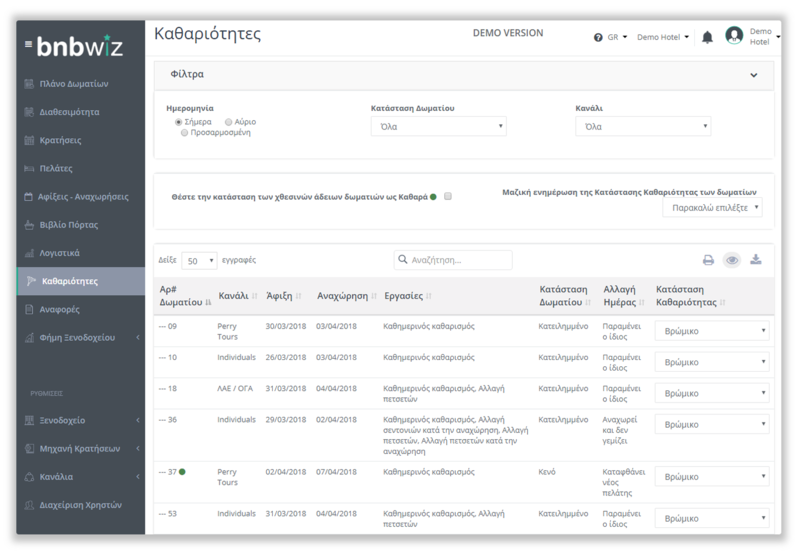 In this way the bookings are automatically added to the room plan and the user is exempted from the registration time and the possibility of error. In addition, there is complete synchronization between the online channels, the booking engine, the room plan and also the telephone bookings. 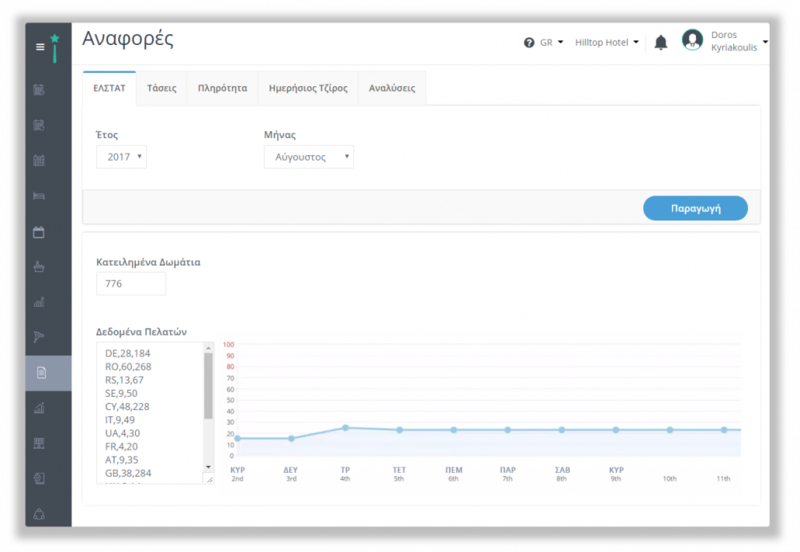 In this way, the risk of duplication is eliminated and all OTA’s and all users are immediately informed about the full picture of availability and reservations. 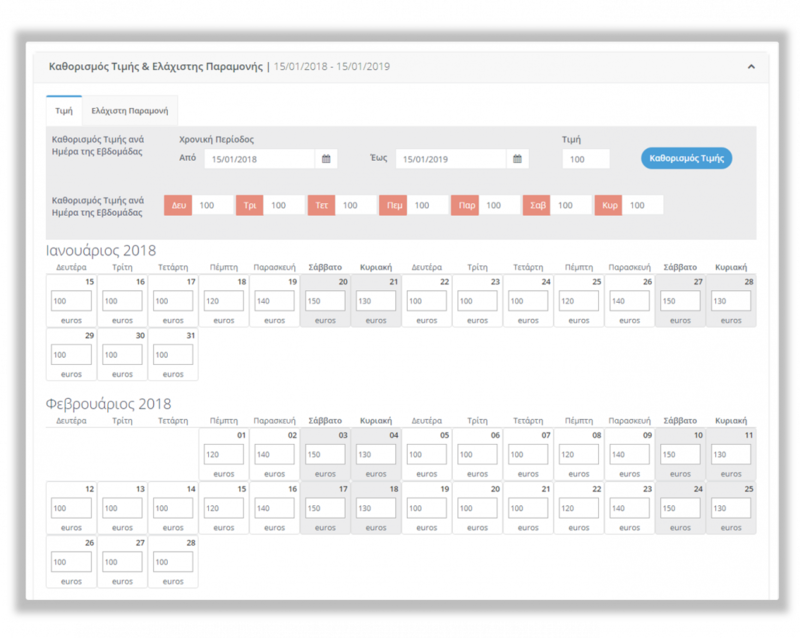 The two-way Channel Manager allows hoteliers to manage all online channels and the booking engine centrally. Allows optimal distribution of all available rooms on all channels and automatically updates and real-time availability. No manual and time-consuming update of each channel’s extranet is needed. The information coming from OTA’s enters the system, such as bookings, customer details, payment details and changes or cancellations. At the same time the information that the hotelier wants to add the channels sent from bnbwiz management program such as availability of rooms, price differences per day or multiple days, no-show customer, mistaken card details etc. Finally, full access is provided to the details of the cards reserved for the visitors’ reservation up to three days after their departure. The bnbwiz management system is designed to allow the registration of telephone , mail or physical presence bookings in the shortest possible time. Finding available rooms can be done either directly from the plan or using the search filter where only the available rooms appear in relation to the criteria selected. In case the booking is made from a repeater visitor, the details are automatically filled in. Finally, the charges are categorized into price lists from which the desired one can be selected and then any change or intervention is easily carried out. Bnbwiz makes it possible to connect with all payment methods and partner banks. Both bookings made via the booking engine on the site and those booked by telephone it is possible to pay a prepayment via link or automated mail with the details of the booking and the bank account details for the deposit. The daily work is monitored through the “Arrivals – Departures” menu. In this way accurate information is obtained about the data of each day. More specifically, the number of arrivals and their necessary information is available, while access to the number of departures is available with an exact picture of any unpaid balance (room – bar – restaurant). In addition, it is possible to make the best possible provision for the supplies that will be needed, according to the planned meals and of course the necessary human resources, to meet the needs of the visitors. Finally, there is direct access to the history of customer movements expected for better and more personalized service. See your overview for today, tomorrow or another day. Depending on the seasonality and demand for apartments, there is the possibility of differentiating the price at day level or specific dates such as weekends or public holidays. In addition, multiple pricelists are supported, depending on room types, number of people staying in rooms, meals, date of booking, etc. In this way, profit margins are increased, especially in times of high demand, but it is also an incentive for visitors to travel in periods of low demand, increasing occupancy. 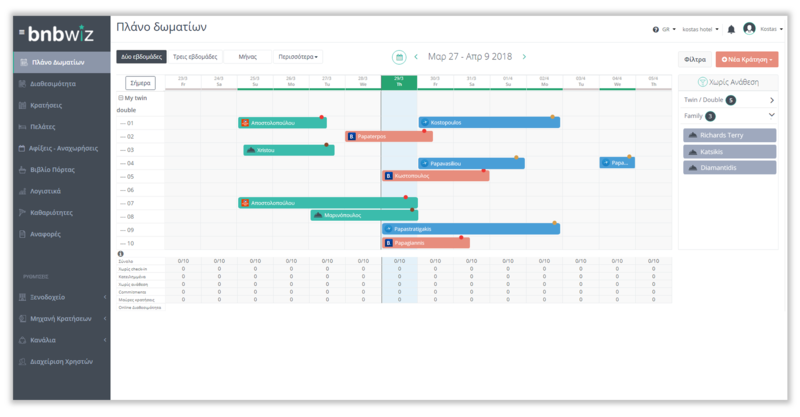 Using the bnbwiz management system to integrate contract terms with conventional agencies, complex terms and complex monitoring of collaboration are simplified. The hotelier may choose price lists for bookings of agencies which vary according to the prices, the minimum days of stay, the terms of payment etc. In addition, invoices of agencies can be made electronically and in an organized way, invoices can be sent directly by mail and payments made in a timely manner. This improves the hotel’s fluidity and makes it easy to book and balance. 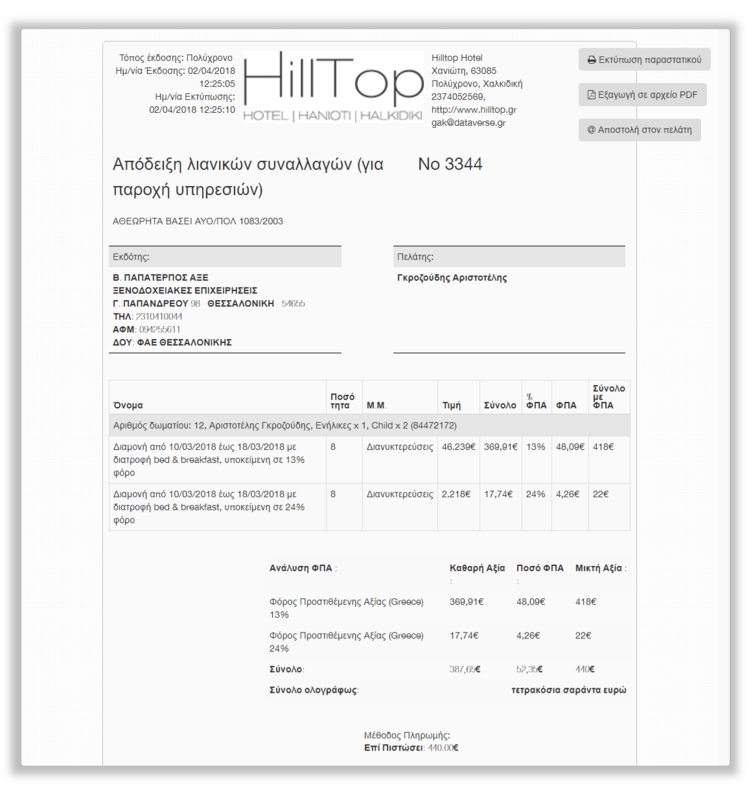 Through the bnbwiz management system, the accounting procedures are automated. For each booking, the corresponding pricing can be issued in one move if the user chooses it. Paperless & inkless e-invoicing is supported, which will be mandatory pursuant to the Finance Ministry’s announcements from 01/01/2020. In addition, the government tax is automatically calculated and the corresponding document is issued in accordance with the tax provisions. External accountants can access the data they are interested in and receive the report electronically. This saves time for bureaucracy work, which can be utilized in more constructive and lucrative work. Improving collaboration with external accountants and avoiding mistakes and omissions that can create a financial impact on the hotel. Bnbwiz can create the optimal daily cleaning program according to the requirements of each hotel. The program includes only the rooms to be cleaned depending on the day of check-in, the channel from where the reservation originates, the special requirements of the visitors, etc. There is also a detailed description of the cleaning work that needs to be done, such as changing linen, cleaning or changing according to each hotel policy. The hotelier can predict human resources needs according to the workload and allocate employees’ work schedule more efficiently. The bnbwiz management system incorporates a plethora of reports and analyzes to provide a clear and complete picture of the hotel’s activities and to provide all the necessary information to the management to select the most appropriate strategy. References make it easier for users to work on a daily basis. Information such as occupancy, historical data comparisons, market trends, channel efficiency, visitor nationalities, and much more are provided. 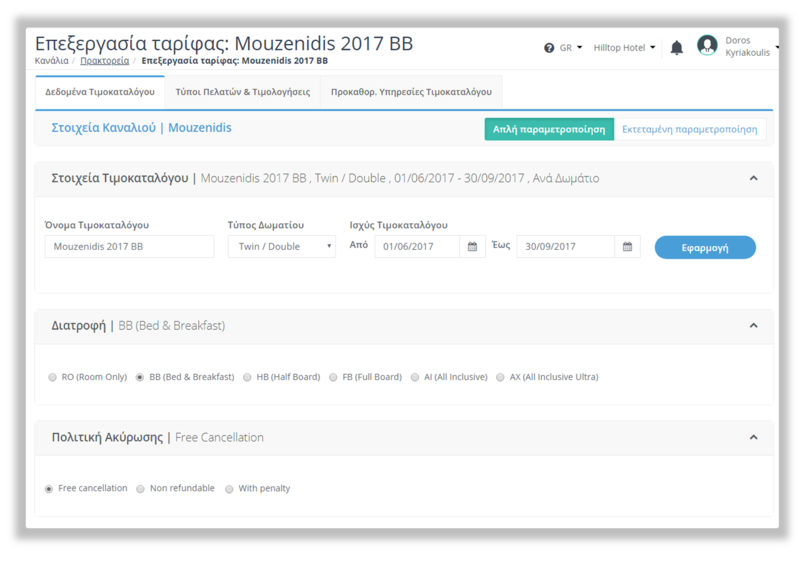 An indicative example of saving time is the report with the data required by ELSTAT, which is automatically generated by bnbwiz in the exact form that the statistical authority wants. In manuscript, this process is estimated at 2-6 productive hours per month, which are now saved to the benefit of the hotel. 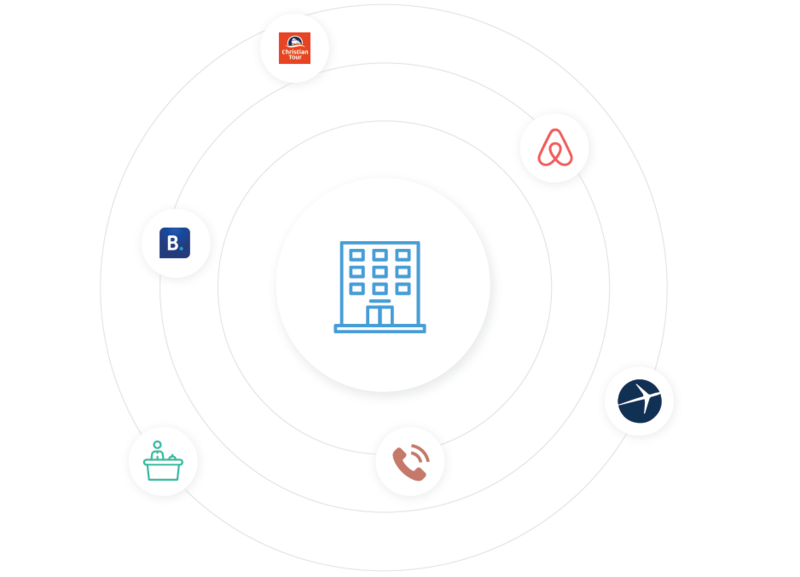 For owners of more than one hotel, the bnbwiz system has anticipated their integration into a centralized management point with easy rotation across the units.